This is the free version of Lycka WordPress Theme with basic functionality. 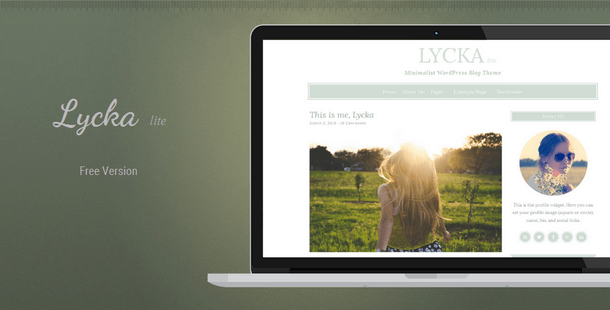 Lycka lite is a clean minimal and responsive WordPress theme. It’s ideal for beginner and professional blogger, and also suitable for personal blog, food blogger and photo blogger! The theme options of Lycka are implemented in the WordPress theme customizer including live preview. Lycka lite has been coded with care and by keeping performance best practices and WordPress coding standards in mind. Lycka lite has been coded with keeping SEO best practices in mind to create a solid fundament for good rankings. Lycka lite is distributed under the terms of the GNU GPL. You may customize the theme in every way you want. If you like Lycka lite WordPress Theme, you will LOVE the premium version. The premium version of Lycka WordPress Theme offers many more great features and options. Configure your own news website or blog within a few minutes and benefit from endless possibilities to customize your website. Learn more about the premium version of Lycka.